Now all kiwilimón recipes have nutritional information to know more accurately the nutrients that you give to your family in the dishes that you cook. How is the nutritional information in each recipe? Each of our ingredients is linked to a reliable database called ESHA, which in turn is based on the latest USDA nutrition data (from the US Department of Agriculture). What does it mean that the information is based on a 2000 kilocalories diet? How to read the "Label" of nutritional information? 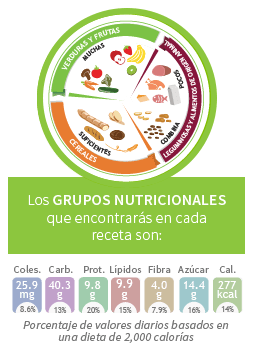 The percentages that appear in each nutrient is the percentage of each that the recipe gives you compared to the recommended daily intake of each one. is the amount that a food gives you of the total energy you need per day so that the metabolic processes that your body needs and the energy you need to burn during the day to function are carried out. 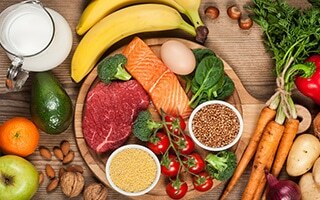 are those nutrients whose main function is to provide energy to the body mainly to the brain and nervous system, these include sugars, starches and fiber. Starches are present in cereals (bread, tortillas, rice, corn, etc. ), legumes, potatoes, jicamas, among others. They are present in fruits (fructose), milk (lactose), white sugar (sucrose), honey (glucose + fructose), among others. Simple sugars or monosaccharides (glucose, fructose and galactose) are absorbed in the intestine without the need for prior digestion, which is why they are a very quick source of energy, whereas complex sugars must be transformed into simple sugars to be assimilated (such as sugars). starches). It is present in vegetables, fruits, nuts, whole grains and whole vegetables, they are molecules so complex and resistant that we are not able to digest them and reach the large intestine without assimilating. It serves to clean the large and small intestine. they are fundamental for the body since it needs them to repair itself and maintain itself. They are found in animal foods such as meat, dairy products, poultry, fish, eggs, are also found in some vegetable sources such as beans, legumes, peanut butter and some grains such as wheat germ. they are present in vegetable oils (olive, corn, sunflower, peanut) which are unsaturated fatty acids, and in animal fats (bacon, butter, lard), rich in saturated acids. Saturated fatty acids are more difficult to use by the body because they are difficult to break into smaller ones, so sometimes these can accumulate and form plaques inside the arteries causing them to clog. It is an essential substance in the metabolism, it exists naturally in all parts of the body and a certain amount of cholesterol is needed to function properly. Elevated cholesterol levels increase the risk of heart disease. Make the most of this tool! Upload a recipe and know the nutritional information you give to your family. 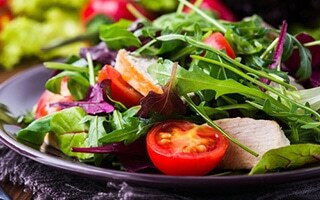 It should be borne in mind that the recommended dietary allowances are only an approximate guide to calculate nutritional needs in any individual and that, when we meet people whose illness interferes with absorption or that alter the metabolism or nutritional needs, they should be modified the contributions that the patient has to receive.